The planned delivery of 800 tonnes of pasta to millions of hungry Australians via welfare agencies across the country is the result of a unique corporate, community and Government collaboration. The Hon. 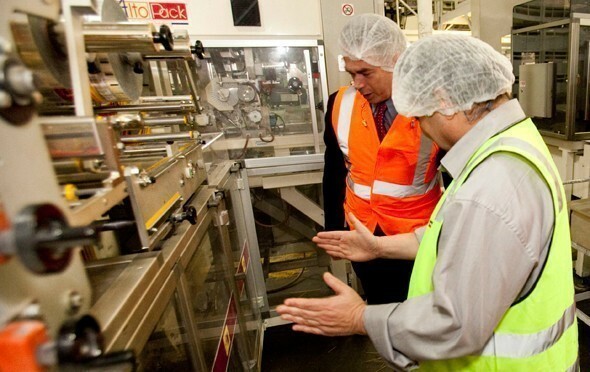 Alan Griffin MP, Minister for Veteran’s Affairs (left) receives a tour of the Rinoldi Pasta Factory courtesy of Production Manager, Tony Farag. The first instalment in the delivery of 800 tonnes of pasta to millions of hungry Australians via welfare agencies across the country is the result of a unique corporate, community and Government collaboration. The Chairman of Foodbank Australia, Enzo Allara and the Victorian Minister for Veteran Affairs, Alan Griffin, have overseen the first delivery of the pasta to some of the 480 welfare agencies across the state which is intended to assist 400,000 Victorians. The making of the pasta and other key staple foods was made possible by a $1 million grant from the Department of Families, Housing, Community Services and Indigenous Affairs (FaHCSIA) and the donation of many of the ingredients by Foodbank’s corporate partners. Foodbank Australia is the nation’s largest hunger relief organisation and plans to provide a packet of pasta and a can of pasta sauce via 2,200 welfare agencies to feed two million Australians facing hunger. To make the pasta and pasta sauce, Foodbank called on its partners to donate ingredients and services. For the production of pasta, Foodbank donors involved included: Rinoldi, Manildra Group, George Western Foods, CBH Group, Toll Logistics, Visy, Perfection Packaging and Shorko with funding support from FaHCSIA, ANZ Bank, Microsoft and CSL. 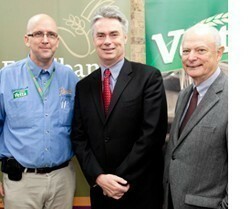 (from left) Rinoldi Pasta Commercial Director, Bill Quayle, the Hon. Alan Griffin MP, Minister for Veteran’s Affairs and Chairman Foodbank Australia, Enzo Allara. Other key staples are currently being produced within Foodbank’s collaborative supply program. Part of a $1 million grant from FaHCSIA allowed the pasta project to get underway. From this government funding, Foodbank says it was able to leverage each dollar of the initial investment to create $10.50 worth of food. Chairman of Foodbank, Enzo Allara says the production of the 800 tonnes of pasta demonstrates how the strong collaboration between government and the private sector can benefit the community. The pasta production is part of Foodbank’s collaborative supply program, which aims to meet the high demand for nutritious food items, including breakfast cereals, pasta, pasta sauce, canned fruit and vegetables. Allara says currently, there is a significant gap between the amount of produce available and what is needed to feed the nation's hungry – its not just homeless, it also affects the elderly, single-parent families, students, asylum seekers and children. Following the delivery in Victoria, the pasta will be distributed throughout the country by Foodbank’s state distribution centres. NPR recently posted an interesting point about how giving away food impacts on people who try to sell food. While the article is about Haiti, it does raise the point that if people cant afford staples like rice and pasta, then there may be a better case to supplement their incomes than deliver this kind of food; or at least better understand why they cant afford this food in Australia today. It would be good to discuss the unintended consequences of this type of charity.